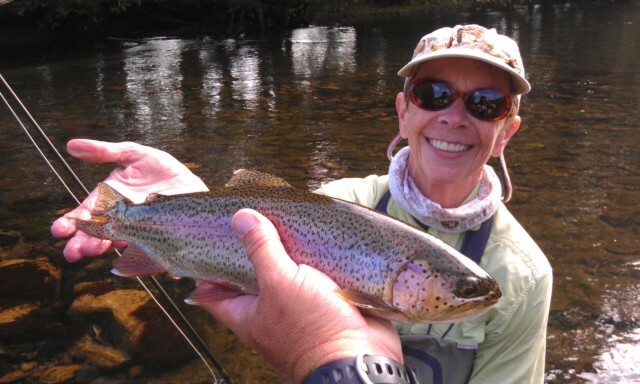 Good Day of Nymphing on the SoHo…..
Wed…..Aug. 31, 2011…….Even though there was a bit of a blue winged olive hatch we didn’t see a ton of rising fish, we caught the first nice fish, a rainbow on a beetle. We spent the rest of the day way downstream nymphing some of the runs and riffs and did very well, noting about 20 fish including some very nice rainbows. 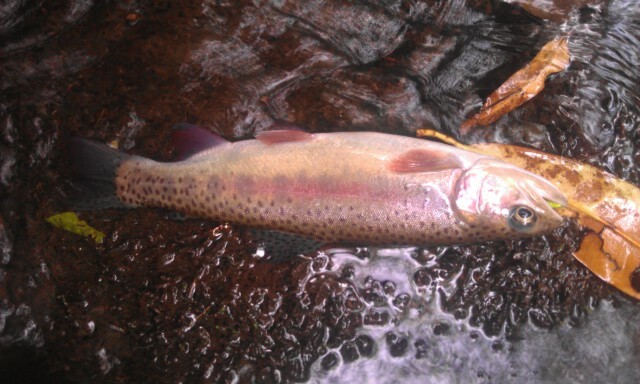 Lost a couple huge fish one of them jumped and spit the fly and the other made a jolting run downstream and broke off. I would have guessed it at 18 to 20 inches. We caught a few more fish and had a late lunch before the water was to rise . Now we are headed home. Will be tying again this evening for tomorrow’s trip guiding Joe Craig of High Point, NC. 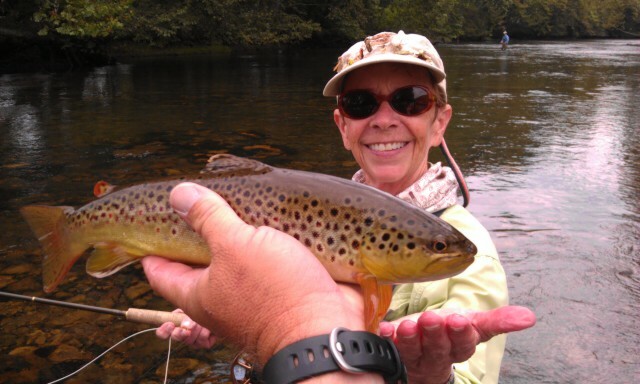 Good Morning from the SoHo…..
Wed…….Aug .31, 2011…….Good morning so far guiding MAC Cheek of Greensboro, we caught the first riser on a beetle but the next down fish, a mix of browns and bows up to 15" we have caught Nymphing with midge patterns. 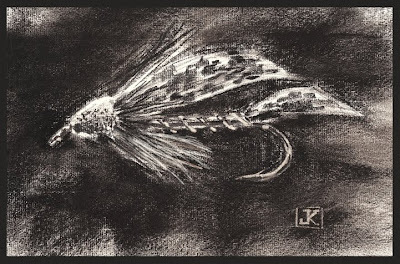 Lost a pair of huge fish one brown and the other a bow…one was close to 20"…..
Wed…….Aug.30, 2011…..I knew it was going to be a great day when the breakfast stop yielded a couple of extra Boberry biscuits . The lady who waited on us deemed the first ones I received as not good enough so she brought out a couple of fresh ones. I scarfed them down the way the SoHo browns scarf down a beetle. We are enroute to her majesty the SoHo to do some early morning terrestrial fishing. I am guiding friend and JWFF regular Mac Cheek. Should be a great day…..stay tuned for more to come. Early Start, Nice TN Morning…..
Sat…..Aug.. 27, 2011……. Just returning from a guided small stream trip, had a great time with Chris Ramseur and Rob Fountain, we successfully fished and dodged Hurricane Irene. We fished the Blue Ridge and caught probably 15-20 rainbows and brookies, all of them wild. 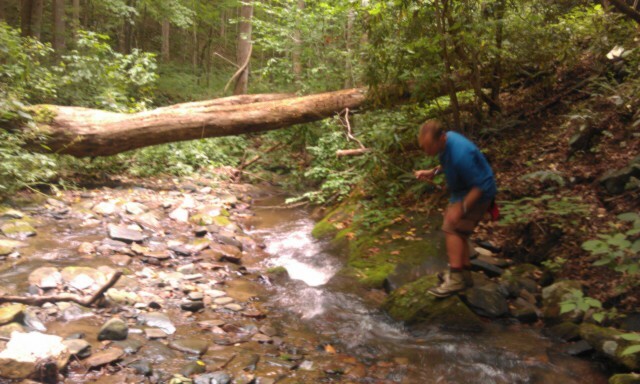 One brookies was 10 "….a trophy as wild brookies go. We. Caught all our fish on dry flies today and if a Carnage Caddis didn’t get them an inchworm did. These fish bunched a green weenie the same way I do a powerhouse steak……. Saw several inchworms hanging from limbs…the perfect dangling trout snack. Taking tomorrow off and getting some rest and guiding Dr Jim and Martha Kaley on Monday in Tennessee. 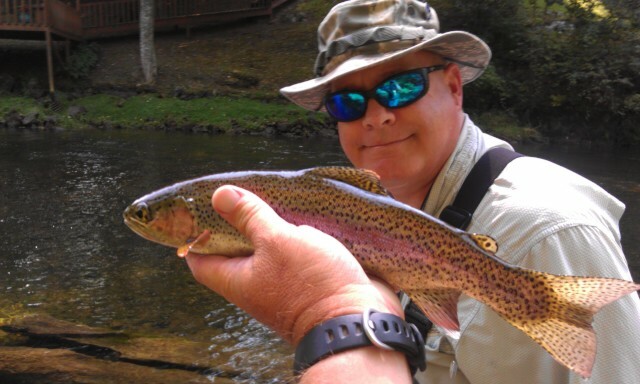 Good Day Small Stream Fishing…..
Fri…..Aug. 26, 2011……It was up and out of here early again today, I met Dr. Bill Berry of Raleigh, NC , a great customer whom I have done a lot of trips with. We met in Yadkinville and drove up …. Bill wanted to catch some smallies so I took him on a favorite section of the New in Grayson County, VA. We fished poppers. It was an exciting start as I tied on Bill’s leader one of my favorite summer bugs. 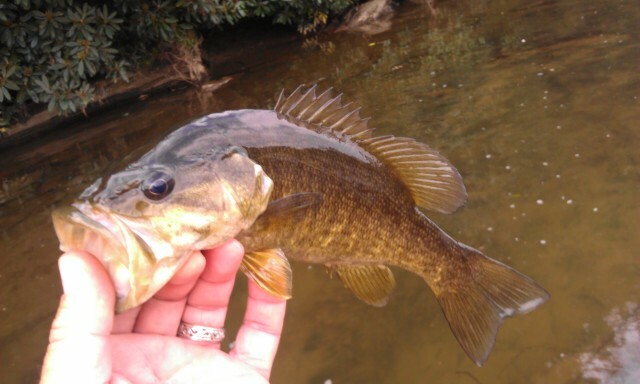 Second cast the popper was sipped and the fish that then jumped was the largest fly hooked smallie I have ever seen. The fish jumped and was well over 20 inches and would have been real close to 6-7lbs. 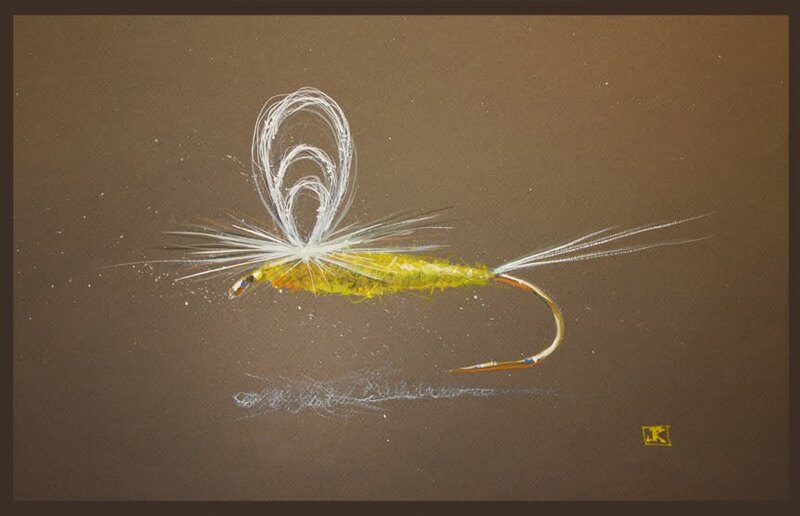 The fish bolted sharply river and got the leader under a ledge and the fish broke off……broke a 10lb tippet. It all happened so fast neither of us really realized what had just happened. It was a fish of a lifetime and much larger than any I have caught. The popper bite continued on pretty steady til about noon and we tallied maybe 20-25 smallmouth total. We caught all fish on poppers. We had lunch and took a break. We fished two other areas but got nothing, the fishing completely shut off . Only a couple half hearted swirls. Mine and Bill’s take on it was that the incoming hurricane and low pressure turned the fish off. The second the wind changed it was like someone turned off the feeding switch. But we had a good day, and as always Bill was great to fish with. I saw him make some unbelievably long casts with a popper…..which isn’t easy no matter who you are. Thurs……Aug . 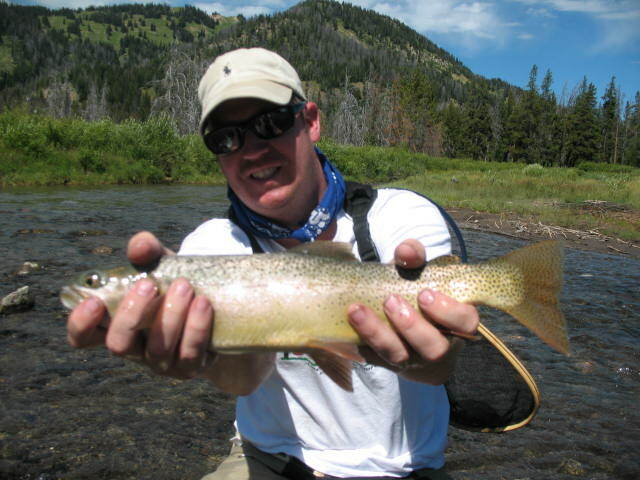 25, 2011…… Had a good trip to Wyoming and always a blast to relive the memories through pictures. Below is a link to the photo album of our 2011 Trip. Offering at least a couple and maybe 3 trips here next year. Have a great deal interest in these trips so far…please let us know if you are interested. Thanks and have a great one..! Thurs……Aug. 25,2011….A return from the land of zero humidity to the land of high humidity…….its hot and steamy here for sure. Wyoming is great and I love the West but I am glad to be back and seeing my wonderful wife and sons, and all our many animals….the dogs were happy to see dad and I was happy to see them. 5 dogs, 2 kitties and a bird….that’s too many …….but one heck of a welcome party…..! 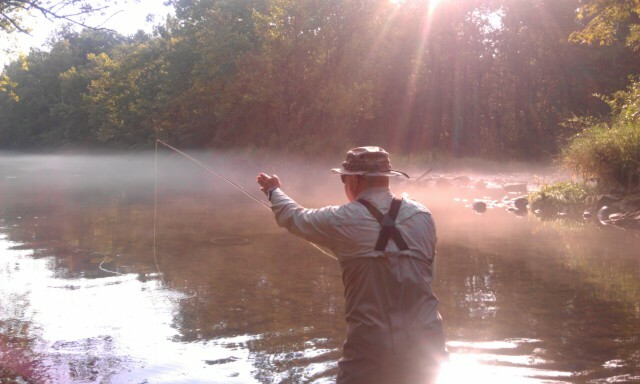 Did a morning lesson with Ken Jordan to prepare him for a upcoming trip to Deep Creek near Bryson City. We worked on casting, rigging, and knot tying. It was fun and I am envious of Ken and where he’ s headed. Will be preparing for a busy week’s guide trips starting tomorrow with Dr. Bill Berry from Raleigh, NC. Bill and I will be smallmouth fishing and possibly some tailwater fishing if the weather has an impact.